Unemployment in Mexico is becoming more and more troubling. Young Mexicans are the segment of the population that is most affected, suffering unemployment rates twice as high as those among adults. Even worse, better-educated professionals have the highest unemployment rate. Government efforts to raise educational levels in order to promote economic development have failed. Some people blame the neo-liberal economic model, claiming it puts too high a priority on price stability, limits investment, restricts wage growth, and makes conditions even more precarious for the unemployed – a situation that has forced the government to permit indiscriminate growth in the informal, underground economy. Still other critics cite increased emigration to the United States as proof of Mexico’s inability to generate the jobs that people demand. The Mexican economy faces a dilemma: Either choose the path toward growth or choose to control inflation [a byproduct of growth]; the latter option has a negative impact on job growth. In Mexico, industrial production grew by only 1.6% between January and May, yet inflation grew by 4.33% over the same period. Mexico’s production problem is a serious one when compared with other Latin American countries such as Chile, Argentina and Brazil where industrial production grew 6.8%, 6.3% and 6.8%, respectively during those months. Over the last five years, the official unemployment rate in Mexican cities has grown by 0.72% to reach 3.8%. Although that figure is far below the unemployment indexes in the rest of Latin America, the European Union, the United States and much of Asia, Mexico faces a serious problem generating jobs. The Mexican economy’s inability to generate jobs has become a chronic problem. According to Ibrahim Villaseñor, a Mexican researcher currently in the economics doctorate program at the Complutense University of Madrid (Spain), “The structural reforms begun by neo-liberal governments have limited the ability of the economy to create jobs.” Villaseñor says that the strategies of recent Mexican governments have focused on three goals: First, economic liberalization – above all, free trade. Second, privatization of 1,200 state-owned companies; this has left only a portion of the energy sector in state hands. Third, deregulation of the national legal framework to make it easier for the neo-liberal model to function. 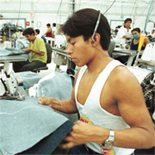 According to INEGI, Mexico’s national institute for statistics, geographic and information technology, the unemployment rate among “economically active” people between the ages of 20 and 24 reached 4.9% during the first quarter of 2005. That is a much higher rate than the 2.8% registered for the population as a whole. These figures show that unemployment in Mexico affects young people much more than it affects other segments of the population. Nevertheless, the most alarming statistic is this one: Unemployment has the greatest impact on people who have a university education. Among people out of work in January 2005, 50.4% had either a high-school education or more schooling. According to the Ministry of Public Education’s planning and coordination bureau, 312,000 young people finished their secondary studies during 2001-2002 academic year, but only 34% of them found a job appropriate for their career track. Despite this alarming situation, Mexico’s unemployment rates are relatively low compared with other Latin American countries. How can this contradiction be explained? All indicators point to the existence of a large “underground” economy. Unlike workers in the European Union, the United States, and Argentina, Mexicans don’t have unemployment insurance. In addition, living conditions limit how much time people can survive without a source of income. “Unemployment in Mexico is a luxury,” says Enrique Cuevas, an economic researcher at the University of Guadalajara. “You have to bring money home, and the income you earn on the job is getting more and more uncertain. You need to have two or three jobs so you can make ends meet.” When it comes to employment, the main problem is “not so much unemployment, but the extraordinary growth in the underground economy,” adds Cuevas. Despite crusading efforts by several business and political leaders, longed-for reform of the labor market has yet to take place. “What they are looking for is the deregulation of work, which would eliminate worker benefits and cut down on their rights. They would even allow the sort of labor contracts that do not provide for any seniority rights, although that would damage job quality,” notes Cuevas. Over the last six years, the number of workers who have full-time jobs covered by the Mexican Institute of Social Security has dropped significantly. In 2000, 13 million workers were covered by insurance, but only 12.6 million are covered nowadays; 400,000 full-time jobs have been lost in almost six years. Conditions look even more critical when you consider there is an annual demand for about 1.2 million new jobs, but only about 300,000 new jobs will be created in 2005, according to government estimates. At best, Mexico will have a deficit of 900,000 jobs for this year alone. That doesn’t count the deficit accumulated in earlier years. According to an INEGI report, about 60% of those people who do have jobs receive no job benefits. And less than half of the workforce has a written contract and stable job conditions. In short, more than half of the active population is either unemployed or has an unstable job. Other worrisome facts revealed in the INEGI report: Almost three out of every 100 workers in 2004 was unemployed, and 60% of those people who were working had no job benefits. Outside major metropolitan areas, the figures were even worse: More than 80% of the rural workforce had no job benefits. Among the country’s best educated segment, the unemployed are almost the norm, according to the Mexican Institute of Youth. Nearly 50% of all unemployed young people in Mexico have been educated at the secondary level or above. Contrary to expectations, the lower the educational level, the lower the unemployment rate. Companies depend on the availability of low-wage workers who are usually less educated. That way, they can recruit workers in the cheapest possible way, and can guarantee their company’s competitiveness. Mexico’s labor market is characterized by low value-added jobs that pay poor wages. It also lacks a labor culture. Among professionals with advanced degrees, unemployment will continue to grow in coming years, according to a report by the current government and a study by Olga Bustos, professor of psychology at the National Autonomous University of Mexico (UNAM) in Mexico City. According to Bustos, over the coming six years, 813,169 young graduates will be unable to find jobs, despite their degrees in medicine, dentistry, law, accounting, business administration, architecture, civil engineering, and communications. Bustos’ study reveals that job markets in those sectors are saturated. For example, she explains, for each new job in the healthcare sector, there are 2.5 applicants. In job markets for professionals trained in biology, ecology, physics, mathematics and chemistry, at least 38,648 people will not be able to find work. Although 57,398 graduates will enter the job market, only about 18,750 will be able to find work. Something quite similar is happening in other professional areas, including accounting, law, communications, marketing, psychology, international relations and administration. The Civic Observatory for Education reports that there is a great risk of frustrating the expectations that young people have about their future. “Symptoms of social breakdown have begun to spring up, including juvenile violence and vandalism; lack of motivation and apathy; growing consumption of drugs, and various other illegal activities that are tied to unemployment. Other symptoms are a shortage of educational opportunities and, in general, the absence of alternatives for participating in various spheres of activity.” The Observatory is extremely worried about the shortage of opportunities for finding decent work and the growing under-utilization of a workforce that, paradoxically, is becoming more and more educated. The Observatory notes that, beyond the urgent need for an effective educational policy, there is an urgent need for significant changes in the structure of the labor market, as well as new methods that companies can use for choosing and recruiting workers. In recent months, the Mexican government has announced new labor policy initiatives that are tied to its educational initiatives. The first policy is the National Occupational and Work Survey, which will enable the government to collect detailed data about the changing dynamics of Mexico’s labor market. The survey will enable the government to create parameters for measuring Mexico’s performance against international standards. The second new initiative is the Mexican Observatory of Labor. Using the Internet, this tool will enable the government to track key indicators about 53 professional careers and more than 1,500 job categories. Among other services, the Observatory will also provide advice about career selection and labor market forecasts, sector by sector, for people who look for jobs at employment offices, job fairs and elsewhere.